The coloured prototypes are finally revealed during Winter Wonderfest 2012. They were previously announced in an earlier event. Written and illustrated by Togashi Yoshihiro 冨樫義博, the manga series was first published in 1990. That’s more than twenty years ago ^^;; I think a number of you aren’t even born yet lol~ I’m think these two boys were probably made into figures because Kotobukiya received requests for them in their figure survey. Anyway, it was that long ago, so I can’t remember very much about the series already. The only thing still fresh in my mind is they are probably one of the first couples in BL doujinshi that I was exposed to as a newbie BL fangirl. And I also loved the kemono-mimi (animal ears) on Kurama when he is in his Youko form. Yu Yu Hakusho follows Yusuke Urameshi, a street-brawling delinquent who, in an uncharacteristic act of altruism, is hit by a car and killed in an attempt to save a young boy by pushing him out of the way. His ghost is greeted by Botan, a woman who introduces herself as the pilot of the River Styx, who ferries souls to the “Underworld” where they may be judged for the afterlife. Botan informs Yusuke that his act had caught even the Underworld by surprise and that there was not yet a place made for him in either heaven or hell. Thus Koenma, son of the Underworld’s ruler King Enma, offers Yusuke a chance to return to his body through a series of tests.Yusuke succeeds with the help of his friends Keiko and Kazuma Kuwabara. After returning to life, Koenma grants Yusuke the title of “Underworld Detective”, charging him with investigating supernatural activity within the human world. Kurama (蔵馬) is a demon thief who, after being fatally wounded, fuses his soul with the unborn child of Shiori Minamino, effectively taking over. He is born as Shuichi Minamino (南野 秀一, Minamino Shuuichi), a human with red hair and green eyes, though he retains his demon powers at a much lower level. Kurama had originally planned to return to his demon form after regenerating his powers, but he changed his mind when he came to love his human mother. They have a bond which Kurama cannot bear to break, and so he remains as Shuichi in the human world. He attends the fictional Meioh Private Academy (私立盟王学園, Shiritsu Meiou Gakkou) where his grades are the highest in his year. Voiced by Ogata Megumi in the anime. The sculpt captures the character design very well. Hiei (飛影) is a male fire demon born to a race of female Ice Maidens. The Ice Maidens reproduce every 100 years asexually, always giving birth to a female. A male child is born only if the Maiden has had sexual conact with a male, which is forbidden in their society. 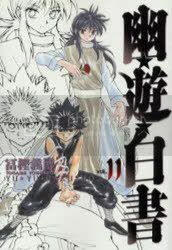 Hiei was born as one of the twin children of the Ice Maiden Hina. As her children were born, Hina wept two tears which crystallized and were given to the babies. Hiei was thrown from the floating Ice Domain by Hina’s closest friend Rie, to his supposed doom. He managed to survive, though, and grew up in the wilderness where he developed a thirst for killing. The only times he found peace were while looking at the tear-gem from his mother. He later decided to find the ice domain in order to take revenge on the women who cast him out. He loses his tear-gem during a battle and, realizing he must now find the stone as well as the Ice Domain, went to the Osteopath Shigure and has the Evil Eye (Jagan in Japanese) implanted in his forehead which gives him many powers, including hypnosis, telepathy, and clairvoyance or remote viewing. Voiced by Hiyama Nobuyuki. Same for Hiei’s sculpt too. Very well-made and captures his badass attitude well. Although they are beautifully made, it’s unlikely that I’ll preorder these boys at the full price. However, I would definitely consider it during a sale.